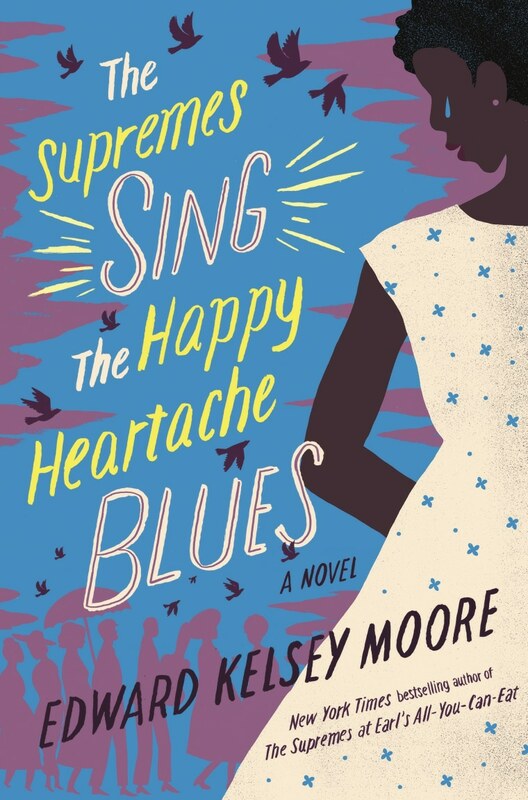 The Supremes Sing the Happy Heartache Blues, a new novel of passions, family, and forgiveness by author Edward Kelsey Moore.Courtesy of: Henry Holt and Co.
320 pp. Henry Holt and Company. $28. How does a professional cellist become a New York Times bestselling author? Edward Kelsey Moore traces his literary imaginings to the Indianapolis public library. After the Indianapolis Symphony Orchestra visited his grade school, it sparked what would become a lifetime love of classical music. Teachers encouraged young Moore's budding talent on the cello, and his parents paid for private lessons. That early nurturing, additional studies and countless hours of practice to master his craft, would lead to a professional career. Moore has performed for some three decades with leading orchestras, touring the country and world. He paid homage to music with the title of his 2013 debut novel, `The Supremes at Earl's All-You-Can-Eat.’ It nabbed a `First Novelist Award’ from the Black Caucus of the American Library Association, landed on The New York Times Best Sellers list, and has been optioned for a film. Now comes a sequel, `The Supremes Sing the Happy Heartache Blues,’ published in June 2017. Readers are taken back to a middle-class Black community in Indiana, where a trio of longtime best friends (nicknamed “The Supremes”) gather on Sundays after church at a local diner. They gossip, sample cherry pie, and share life’s passages. "My characters had more to say, so I wrote the new novel," said Moore. The plot involves a “late in life wedding” between characters Miss Beatrice Jordan and Mr. Forrest Payne, owner of the Pink Slipper gentleman’s club. When an enigmatic musician shows up, drama ensues. Mother-daughter relationships, fathers and sons, and the topic of forgiveness figure prominently, delivered with humor and spice. Moore, who now calls Chicago home, recently wrapped the first leg of a national book tour and will hit other cities in the fall. He spoke recently with NBC News; the interview has been edited and condensed. Edward Kelsey MooreCourtesy of: Henry Holt and Co.
NBC News: Let’s discuss the book title. Were you influenced by Motown’s legendary girl group, The Supremes? Edward Kelsey Moore: Yes! I am a tremendous fan. As a child, I once made a collage of Diana Ross. In my office, on my music stand, is a program from a 1970 Diana Ross concert. I found it when I was back home in Indy, while cleaning out a closet in my old room. Your characters have been described as lively, loveable and relatable. The book offers laughs and catharsis through comedy, yet they experience heartache. I noticed the artwork depicted on the book’s cover shows a woman shedding a tear. It’s a funny novel about the different ups and downs of life and life-altering events. In my work, some of the recurring themes are death, family and religion. I’m a gay man from a very religious family, which has caused certain challenges, even to this day. Many of my friends are gone after dying in the `80s [of HIV/AIDS]. However, in the darkest moments of life, a common thread among people whom I’ve known who’ve emerged emotionally intact, is that they’ve kept some sense of humor. It’s like, `This may be crazy and awful,’ but also finding something funny about it. They don’t just live through something, but survive it. I find that fascinating. You’ve penned short stories, essays for public radio and now novels that are even being translated internationally. Are you surprised by your newfound literary career and the success you’ve found? It’s a fantasy come true. I didn’t have any formal literary education, so I’d always thought of my writing as a lovely little hobby. I was in a state of shock when a major publisher wanted the book, and it sold. You just hope somebody will read your work. It’s been an incredible thrill. Yes, I’ve started work on a third novel. The first was about friendship. The second novel, forgiveness. The third will go in a completely different direction. It’s about generosity and selfishness. Below is an excerpt from "THE SUPREMES SING THE HAPPY HEARTACHE BLUES" published by Henry Holt and Co., a member of Macmillan Publishers. Copyright © 2017 by Edward Kelsey Moore. The Supremes Sing the Happy Heartache Blues by Edward Kelsey Moore.Courtesy of: Henry Holt and Co. It was a love song. At least it started out that way. The lyrics told the tale of a romance between a man and the woman who made his life worth living. Being a blues song, it was also about how that woman repeatedly broke the man’s heart and then repaid his forgiving ways by bringing a world of suffering down on him. The beautiful melody soared and plunged, each verse proclaiming rapturous happiness and gut-wrenching pain. Here, in a church, this piece of music couldn’t have been further outside its natural habitat. But the tune’s lovely mournfulness echoed from the back wall to the baptismal pool and from the marble floor to the vaulted ceiling and settled in as if the forlorn cry had always lived here. As the song continued and grew sadder with every line, I thought of my parents, Dora and Wilbur Jackson. The blues was Mama and Daddy’s music. Nearly every weekend of my childhood, they spent their evenings in our living room, listening to scratchy recordings of old-timey blues songs on the hi-fi. One of those might have been as sorrowful as the dirge ringing through the church, but I couldn’t recall hearing anything that touched this song for sheer misery. Mama preferred her blues on the cheerier and dirtier side—nasty tunes loaded with crude jokes about hot dogs, jelly rolls, and pink Cadillacs. The gloomy ballads, like this one, were Daddy’s favorites. I never saw him happier than when he was huddled up with Mama on the sofa, humming along with an ode to agony. He would bob his head to the pulse of the music, like he was offering encouragement to a down-in-the-mouth singer who was sitting right next to him, croaking out his hard luck. Sometimes, before sending me to bed, my parents would allow me to squeeze in between them. They’ve both been dead for years now, but their bad singing lingers in my memory. And, because I inherited their tuneless voices, I remind myself of my parents every time I rip into some unfortunate melody. Whenever I hear a melancholy blues, I feel the roughness of Daddy’s fingertips, callused by years of carpentry work, sliding over my arm like he was playing a soulful riff on imaginary strings that ran from my elbow to my wrist. I’d be ordered off to bed when Mama’d had enough of the dreariness and wanted to listen to a record about rocking and rolling and loving that was too grown-up for my young ears. My mother’s “book” was a calendar from Stewart’s Funeral Home that she kept in her pocketbook. The cover of the calendar showed a gray-and-white spotted colt and a small boy in blue overalls. They were in a meadow, both of them jumping off the ground in an expression of unrestrained bliss. Above the picture were the words “Jump for Joy,” and below, “Happy thoughts to you and yours from Stewart’s Funeral Home.” Whenever Mama ran into something that she felt was remarkable enough to merit celebration, she wrote a note on that day’s date so she’d never forget it. Mama opened her pocketbook then and pulled out a rolled-up wall calendar. She flipped three pages back to Easter and showed the pastor where she had written, “Best Sermon Ever” in the little square for that date. Then she showed him how she had jotted brief notes on each day of the calendar since then. She pulled a pen from her pocketbook and wrote an entry on that day’s date in her book that read, “Second-best sermon ever.” Then she patted Reverend Brown on his cheek and walked away from Holy Family Baptist forever. Stewart’s Funeral Home came out with a new calendar each year. Since Mr. Stewart was notoriously cheap, he reused the same cover. Mama had a fresh “Jump for Joy” book every January. She wrote in her book until her last morning on this earth. The singer who sat hunched over his guitar in a dark corner, crooning and roaring about loving and forgiving his cruel woman, looked to be about seventy. He was tall and skinny, and he had a white beard that swallowed his face from nose to neck. James was right. Daddy would have loved the way the blues man bent the pitches of the tune in such a bleak way that you knew love had brought him trouble and that there would be more bad news coming in the days ahead. “The blues is what a love song turns into after the singer’s had his teeth kicked out,” Daddy once said. What kind of beating had life given to this bearded man, who stared at the floor and filled the room with gorgeous sorrow? How did he end up here, curled around his guitar, letting loose a heartbreaking cry for all the world to hear? Every line of this song brought to mind Daddy’s definition of the blues. There was no way this man had a single unbroken tooth left in his mouth.